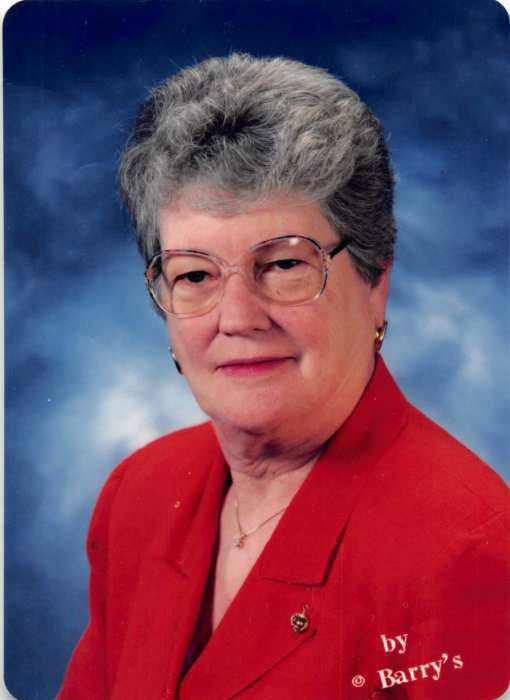 Betty Jane Richardson-Rathbun-Trickler, 89, of La Porte, IN passed on March 22, 2019 at Brentwood Senior Living Center. She is preceded in death by her parents, Clyde and Elizabeth (Grewey) Richardson and siblings, Claudine R. Janes, Doris Irene Dobson, I. Dale Richardson, Louis Arthur Richardson, and Philip Eugene Richardson. Betty was born on September 21, 1929 on Katy Hill in Athens County, Ohio. The family moved from Athens County to a farm outside Mt. Sterling, OH when she was 9. It was there she grew up and graduated from Mount Sterling High School. Her oldest sister Claudine was one of her teachers. She received her nursing degree in 1952 from Ball Hospital School of Nursing in Muncie, IN. She later received her BSN from Ball State University in 1971. She worked at Ball Memorial Hospital for over 20 years, many as the Assistant Director of Nursing. It was at school that she meet and married Keith Caldwell Rathbun on August 3, 1951; they had four children together. She later divorced Keith in 1980. Her nursing career then took her to La Porte County Hospital in La Porte, IN, to take a position as Vice President of Nursing in 1981. It was there she met and found her last love in C. Jack Trickler. They married on October 6, 1984 and remained together for the next 35 years. Their combined family grew to seven. They were quite a team. Betty and Jack were members of First United Methodist Church in La Porte, Honorary Life Members of La Porte Hospital Foundation, and recipients of the Lester Radke Community Service Award among other things. Betty was a founding member of Dunebrook, a social services organization. She worked with local Red Cross, United Way and countless other organizations. She was a member of the Ball State Alumni Association; she started a scholarship there as well. She truly loved helping others and being involved in the community. Being a product of rural farm life during the Great Depression, she had to learn many skills. She was a great home cook, seamstress, knitted and later quilted for fun. Her later hobbies were gardening, bird watching, model trains (a member of Illiana Garden Railroad Society), ballroom dancing, and family history. She loved playing games of any kind and played a mean game of pool. She loved family get togethers, the bigger the better. Betty loved life and lived it well. She is survived by her husband, C. Jack Trickler; her four children, Jeff Rathbun of Upland, IN, Kathie (Chris) Hiatt of Muncie, IN, Ron Rathbun of Dunkirk, IN, and Rick (Cliff) Rathbun of Indianapolis, IN; her stepchildren, Alice (Wilson) Palmer of Cincinnati, OH, Ann (Jock) McNulty of Washington D.C., and John (Vicki) Trickler of La Porte, IN; nine grandchildren; and twelve great-grandchildren. A Celebration of Life Memorial Service will be held at 11 am (CT) on Monday, April 8, 2019 at the First United Methodist Church of La Porte. Visitation will be held from 10 am until the time of service on Monday at the church. There will be a second memorial in Muncie, IN on her 90th birthday September 21, 2019 at a location and time yet to be determined. Memorial contributions may be made to Betty's Scholarship Fund #6366 at www.bsu.edu/give.com.